Sky is the nations biggest supplier of subscription Television in the UK with Hundreds of Channels including Sport Movies and Documentaries. Unfortunately the installation side of the business is not up to much with customers having not much choice as to where the satellite dish is to be installed. If you are unhappy with location of dish and require it mounting on a chimney or hidden away then feel free to contact me for advice. A new Satellite dish fitted with twin cable is £80.00 complete. 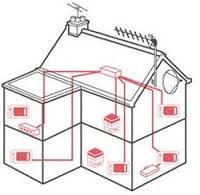 We here at aerial-tek can distribute SKY to many rooms from the one box same subscription along with the Aerial allowing both Freeview and SKY to be viewable and switchable using the SKY TV LINK system. Sky have taken this facility out of the new boxes to stop this being done but using an io link one tv link can be fed or alternatively if more than one feed is to be done we use A TRIAX Trilink kit. Whatever you are after give me a call.